Turkey's interior minister on Sunday identified the suicide bomber who killed four foreign tourists in Istanbul as a militant with links to the Islamic State group. ISTANBUL (AP) — Turkey's interior minister on Sunday identified the suicide bomber who killed four foreign tourists in Istanbul as a militant with links to the Islamic State group. Minister Efkan Ala said the bomber was Turkish citizen Mehmet Ozturk, who was born in 1992 in Gaziantep province, which borders Syria. He said Ozturk wasn't on any list of wanted suspects and five other people were detained as part of the investigation. Saturday's explosion wounded dozens of others. Among the fatalities were two American-Israelis, another Israeli and an Iranian. The attack targeted Istanbul's pedestrian Istiklal Street, which is lined with shops and cafes in an area that also has government offices and foreign missions. "The identity of the terrorist who carried out this reprehensible attack has been determined...The findings obtained show that the terrorist is linked to the Daesh terror organization," the minister said, using an alternative acronym for IS. Istanbul remained tense a day after the bombing, with Turkish authorities postponing a high-profile soccer match between two major teams, citing an unspecified threat. The Istanbul governor's office said Sunday's Galatasaray-Fenerbahce derby was canceled following "the assessment of serious intelligence." 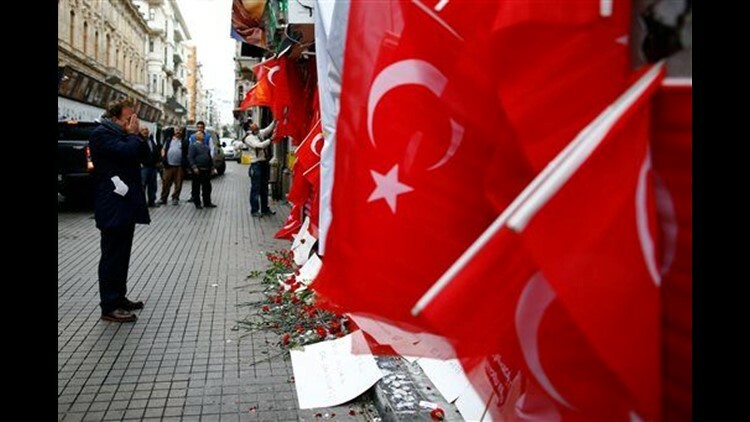 Turkey has endured six suicide bombing attacks in less than a year. The country faces a wide array of security threats including from ultra-left radicals, Kurdish rebels demanding greater autonomy who currently are locked in battle with security forces in the southeast, and IS. Turkey is also a partner in the U.S.-led coalition against IS, and its air bases are being used to launch bombing runs against the group in neighboring Syria. Two of the attacks this year hit the Turkish capital, Ankara. An offshoot of the banned Kurdistan Workers' Union claimed the Feb. 17 car bombing that killed 29 people and the March 13 suicide bombing that killed 37 people. On Jan. 12, an attack that Turkish authorities blamed on IS claimed the lives of a dozen German tourists visiting Istanbul's historic sites. That attack delivered a bitter blow to the country's vital tourism sector. Ala said Turkey was determined to press ahead with its fight against extremist groups, but admitted it was difficult to prevent suicide attacks. "We are working so that they do not happen," the minister said. President Recep Tayyip Erdogan also vowed to defeat groups trying to harm Turkey. "The terror groups and the forces behind them will sooner or later in the end be beaten," Erdogan said. On Sunday, well-wishers placed carnations and candles at the scene of the attack, with one placard reading "We are on the streets, we are not afraid of you." Earlier, Israeli authorities raised the number of Israelis killed in the bombing to three, among them two who also hold American citizenship. The third victim was identified Sunday as Avraham Goldman, 69, from Herzliya. The two others are Simha Damari, 60, from Dimona and Yonata Shor, 40, from Tel Aviv. Israel's country's counterterrorism bureau upgraded the threat level in Turkey, issuing a travel advisory that recommends Israelis avoid visiting the country. Israeli Deputy Foreign Minister Tzipi Hotovely said Israel did not believe the Istanbul bomber targeted Israelis. "We don't have intelligence that this attack was directed against Israelis," she said on Army Radio. "It is too early to tell if this was accidentally hitting Israelis or if it was directed at Israelis who left a restaurant." Hotovely said the attack would not affect negotiations to restore ties. Israel and Turkey have been working for months to repair relations after the two former allies split in 2010 following an Israeli naval raid on a Gaza-bound flotilla that killed eight Turkish citizens and one Turkish-American. In the aftermath of the raid, Turkey became one of the strongest critics of Israeli actions in Gaza. Speaking at his weekly Cabinet meeting, Israeli Prime Minister Benjamin Netanyahu said "Terror wreaks death and destruction around the world ... The key to the moral fight against terror is to clarify that terror, the killing of innocent civilians, has no justification - not in Istanbul, not in the Ivory Coast and not in Jerusalem." The Israelis' bodies and other Israelis wounded in the blast were being evacuated while a senior Israeli foreign ministry official headed to Istanbul for meetings with Turkish officials. The attack came has Turkey had heightened security across the country in the run-up to the Kurdish spring festival of Newroz on March 21, which Kurds in Turkey traditionally use to assert their ethnic identity and demand greater rights. Ala said 120,000 police and 80,000 military police were on duty during the Newroz period and more than 1,000 police checkpoints had been set up. The decision to ban the festivities in Istanbul and several other cities were made before the attack and has upset Kurdish citizens demanding greater cultural rights. Policed fired rubber bullets to disperse citizens who tried to celebrate Newroz in Istanbul, and water cannons at Kurdish youths who gathered in the city of Sanliurfa, according to footage broadcast by the DHA news agency. Police also chased away youths in the southern city of Adana. Pope Francis, meanwhile, sent condolences to Erdogan over the attack. The Vatican said Sunday the message noted that Francis was grieving for the casualties and "expresses his prayerful solidarity with all touched by this tragedy." Suzan Fraser reported from Ankara. Bram Janssen in Istanbul, Frances D'Emilio in Rome, and Daniella Cheslow and Aron Heller in Jerusalem, contributed to this report.